S. Dakota Indian Foster Care: Listening To Your Responses : NPR Public Editor Here are some preliminary responses to your comments on the ombudsman process, on sourcing and on the length of my review of an NPR investigation into foster care for Native American children in South Dakota. Many of you wondered what NPR should do next. That is not for me to say, but one officer from the Native American Journalists Association has a suggestion. I also answer a grandmother quoted in the series who called me with a concern about truth. 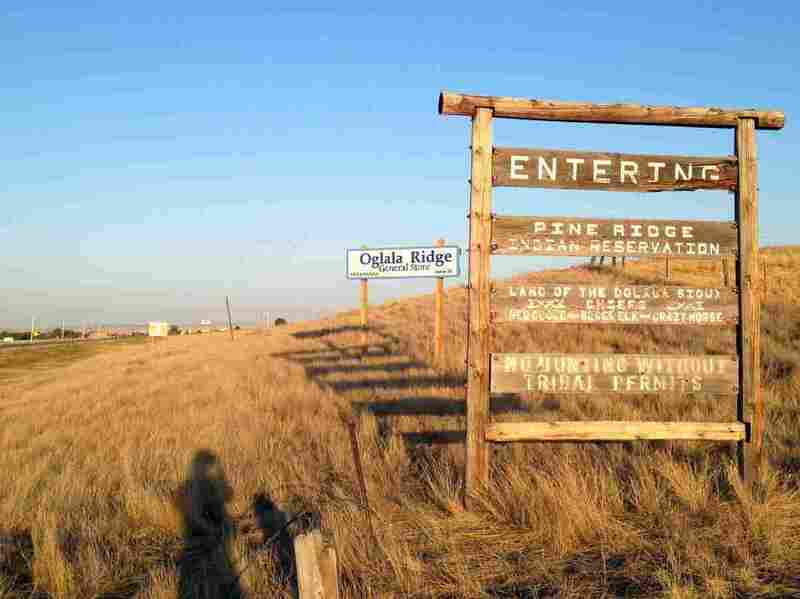 The Pine Ridge Indian Reservation is home to the Oglala Sioux Tribe. In my six years as an ombudsman, first at The Miami Herald and now at NPR, I have never seen such a sustained intelligent and insightful discussion across the comments sections, on social media, in blogs and via email as I have in your responses. We don't all agree, but as Stephanie Stasi wrote in the kick-off comment, "Hats off to NPR as well for allowing the public to see the cracks." I may have made mistakes — I hope not — but NPR has allowed itself to be examined by someone internally who will listen to complaints and investigate them in a spirit of transparency, integrity and goodwill. In a cynical age, these values build trust. As some of you noted, these values are especially demanded of our news media by the online culture that becomes ever more central to our public discourse. The quality of NPR's journalism is superb day in and day out, but having an ombudsman is a humble recognition that all of us can stumble. In that vein, I thought I might respond to some of your comments without reprising my report itself. You will continue to draw your own conclusions about its validity. I will focus instead on its length and my sourcing, on a sensible proposal from an officer of the Native American Journalists Association for where NPR might go next, and on concerns raised by some Native Americans in South Dakota. The sourcing is clearly stated throughout the report for all to see and judge. First were official data and official budget figures, obtained in a long series of requests by me and re-stated in my own charts that are quite different from the way the state keeps its numbers and reports them to the federal government. I constantly ran my statistical presentations back by state officials to make sure that I understood their numbers correctly. I also gave the numbers to the NPR investigative team to challenge. If the numbers, or the conclusions I drew from them, are wrong, please say so. My second main set of sources were the responses from the reporters and editors themselves to my questions. The editors kept most of these responses off the record, opting to release their own public statement instead. Even so, our many discussions informed my analysis. Third were on-the-record responses to my questions by two state officials, and particularly Kim Malsam-Rysdon, the secretary of the state Department of Social Services, the central official in the issue. Fourth, were sources used by the reporters on things such as state rankings, legal interpretations and the removals of children in one particular tribe. Fifth were cites from state law, guidelines from the United States Bureau of Indian Affairs, U.S. Census Bureau figures, Pew Trust legislative history, a Harvard Population and Development Center study, and a quoted interview with a Native American legal expert. Sixth, were U.S. Supreme Court and South Carolina Supreme Court rulings, plus news articles on the arguments made before the U.S. court. Statements from Native American advocates and leaders were taken from linked news articles, and I quoted the radio news director from South Dakota Public Broadcasting. Also cited were other NPR stories. The most prominent source was the transcript of the series itself. For advice, I consulted a number of journalistic and academic colleagues who are experienced in statistics, in investigative journalism, in radio storytelling and in Native American affairs. My conclusions were my own, however. More than anything, I hope NAJA is able to make clear to NPR (and other news outlets in the future) how valuable Native journalists and journalists who have considerable backgrounds in Indian County reporting can be in contributing to important stories like the ones told in Laura Sullivan's 2011 series. At NAJA, we do agree with those who believe NPR and other national news outlets committed to telling under-reported stories would benefit from having both beat reporters who cover Indian Country and editors who understand the large, complex Native issues that unfold in Washington and across the U.S. Native journalists are often best suited for these roles and bring a level of expertise on Native issues that is hard to match. The reason, in part, is because we navigate federal bureaucracies and jurisdictional boundaries, and balance cultural issues — sometimes on a daily basis — simply since we are citizens of both the U.S. and our respective tribal nations. All of these experiences inform our work as journalists. That said, there are certainly strong reporters throughout who are not Native but have dedicated portions of their careers to covering Indian Country and they cover their beats well. I work with several of them at the AP, where we have built a team in the West of reporters who cover stories from Indian Country. I am one of the editors on the team, and while the reporters and editors balance the work of the beat team with our breaking news duties and other pressing stories, there is a system for us that so far has served us well. There are other media outlets and some in the public radio network that have reporters and editors well-versed in Native topics, too. The ombudsman pointed out in his report that the NPR series on the South Dakota foster care system and Native children fell short of including comment from key sources. Among them were tribal judges. I think a seasoned Indian Country reporter and editor, Native or not, would be positioned to see the full scope of a story. Clearly, Laura Sullivan interviewed many sources for her investigation and understood she was tackling a complicated and delicate subject. The fact that there were some avenues of reporting left to pursue and clarifications left to be noted in the three-part series only speaks to the complexity of Indian Country and the maze of federal, state and tribal jurisdictions. It also speaks to the need for more beat reporters with a heightened level expertise on Native issues who understand the big picture and the details, and can translate it all into an understandable report. I don't know Sullivan's resume, and she may already bring this background to her work. There's no doubt that also an editor with knowledge of tribes, tribal law and traditions can be very important on a project. NAJA agrees with NPR and the ombudsman that the 2011 series on Native American children and the South Dakota foster care system highlighted a topic deserving of further national attention. We hope the ombudsman's report doesn't discourage further coverage and accountability reporting within NPR and elsewhere on this topic in the future. While I personally did not agree fully with every point raised in the ombudsman's report, I am glad to see time invested in an extensive review that I hope will ultimately lead to stronger, objective news reporting from Indian Country. Our Native communities are best served when reporting is held to the highest of standards, and it's clear NPR knows this and the ombudsman does too. In the case of this particular report, the ombudsman launched the review in response to complaints from the state of South Dakota. I sincerely hope necessary review also is given when issues with reporters' investigations or the ombudsman's reports are raised by tribal leaders, tribal members, and professionals (Native and non-Native) working on South Dakota's Indian reservations. Some questioned the length of my report. Did the purported transgressions merit 35,000 words? Far worse sins have been discussed in much less space. My answer is simple: the length is influenced by the seriousness of the errors but not based solely on it. It is based more on the complexity of Native American issues; on having to deal with so many major allegations in the series; on the subtlety of tone and innuendo that needed to be clearly laid out to be seen; on the long quotations from the transcript; on a longstanding personal interest of mine in showing how so much of what we confront in journalism and life often isn't how it first appears to be; on a desire to avoid a he-said-she-said format by making my own statements as authoritative as possible; on a larger concern about form versus function in investigative storytelling, a subject that is worth even more space; and, finally, on a desire to be as fair as possible to all — to NPR and its journalists, to social workers and judges, and to the tribes. Sometimes when listeners or readers complain about a story, what they are really doing is asking for a second or different story, rather than disqualifying the first. Did I do that? I feel confident in saying no. One of my main points was that the South Dakota series was neither fair nor entirely accurate because it missed important aspects of the story it took on. Finally, I received a phone call from Janice Howe, the determined grandmother who provides the narrative arc for the first part of the South Dakota series, the part that I found so problematic. She was concerned that I was dismissing the ability of grandmothers to take in neglected grandchildren. Some state social workers, she said, did not give sufficient weight to the cultural role of grandmothers, or were duped by corrupt tribal officials, among other alleged complaints. She was insistent on Indian sovereignty on the reservation, but said that she, too, often called in state social workers to help in child welfare cases in which the extended family was not enough. She was nuanced in her comments to me. She was afraid that my report might undermine everything for which she has fought, and even gone to jail for. I told her what I repeated often in my review and will say again here. I do not know the full truth about what is happening on the ground in South Dakota. My investigation focused on NPR's adherence to its own journalism standards, not on the state, or the Indian Child Welfare Act, or government policy concerning Native Americans. My point was that the NPR series did not prove many of its allegations, which is different from saying that those allegations are not true. I found serious factual and other errors, plus an unfair tone, that led me to conclude that series should not have been aired as it was. But as to what most concerns Howe and many tribal members in South Dakota — which is how children are taken from their extended families and how they often are put in white homes — the story should have included critical context that contradicts the allegations of systematic state abuse for money and cultural bias. My point, in other words, was that NPR's audience and Native Americans themselves deserved to hear the full story, not just part of it. Richard Wexler, current board member and former executive director of the National Coalition for Child Protection Reform (NCCPR), wrote a detailed response to my report in which he concluded that the framing of my critique was fundamentally wrong. The coalition, cited in my report, is a small group that advocates for keeping families intact and is critical of foster care in general. Wexler concluded that my review is "likely to harm both children in South Dakota and journalism at NPR." I totally disagree; my report contributes to maintaining the already considerable strength of NPR's journalism. As for the children of South Dakota and the rest of his detailed response, Wexler makes policy arguments that are perfectly defensible but miss the point. I focus on the standards of the journalism and the policy questions that have to be addressed if the series is to be fair, but I don't take a position on what the policy should be. Each of us will have our own conclusions on policy. I also do not pretend to "re-report" foster care in South Dakota. Rather, I raise questions of context that have to be accounted for but weren't. Separately, my criticism of the use of the coalition's rankings has to do with accuracy and clarity. I, too, say that South Dakota ranks towards the bottom of the coalition's list, but that doesn't make it an outlier, as Wexler maintains. You can read Wexler's full review and conclusions online.